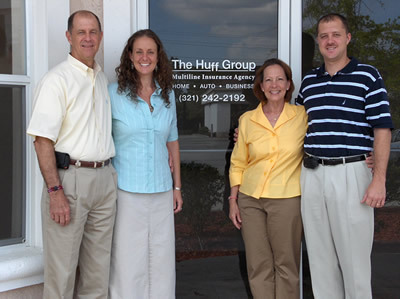 The Huff Group, Inc. is a family owned and operated multiline insurance agency. As a local, independent agency, we know our insurance customers by name. You can answer most of your insurance needs in one location by talking with real people. Knowing the insurance market and being able to access multiple carriers is the key to obtaining the perfect fit for your insurance needs. We have been doing business in Brevard for 30 years and look forward to the opportunity of serving you. The Huff Group has access to a number of insurance companies, all admitted carriers in the state of Florida with A or Better ratings. Whatever your insurance concerns may be, let us create a profile that helps secure your property and assets. Let us help you navigate the world of insurance.